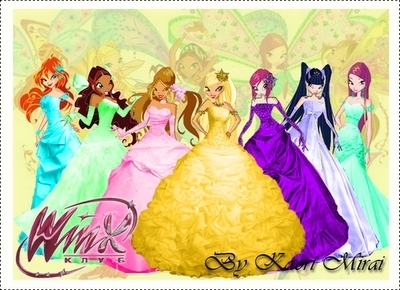 winx club in the ball. . Wallpaper and background images in the The Winx Club club. (From Left to Right): Bloom, Layla/Aisha, Flora, Stella, Tecna, Musa & Roxy. I agry with winxlove2 because bloom looks ugly to me tobut i think tecna loocs prity on that won and roxy,flora,stella,layla.